Available in a variety of stylish upholstery options, the Lena Sofa serves as an outstanding choice in a modern or retro setting. It boasts a button-tufted seat back and sleek angles and contours that give the piece a one-of-a-kind appearance. Also, the sofa provides ample space for up to three guests and blends mid-century and Scandinavian styles into an awe-inspiring design. When it comes to finding a deluxe sofa for your home, you simply cannot go wrong with the Lena Sofa. A really modern look that matches my living room decor perfectly! Inmod has done it again - thank you! easy to keep looking like new! We had some spillage within the first 24 hours of receiving the sofa and it was very easy to remove and clean! Still looks like brand new, I have to say besides how nicely it looks in my living room it is accident proof too! Gray is perfect for colorful and bright accent pillows and decor!! perfect to add a personal touch - looks SMASHING! Splayed legs, button accents give this sofa a leg above the rest - happy to have! 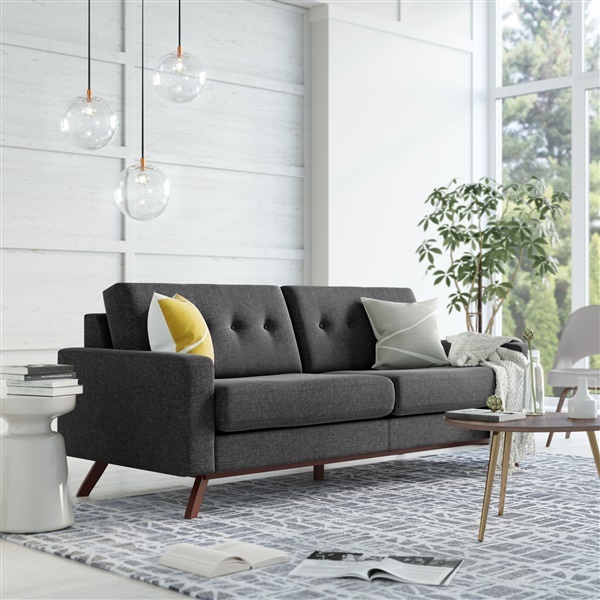 This sofa has such clean cut and crisp lines it completely refreshed the design of my living room with a much more modern feel and contemporary style! The couch took some work to put together. Definitely need a drill to help screw the base onto the couch - you have to get through the wood base in order to secure it. My base originally came with multiple cracks but customer service was very quick to send me a replacement base. The couch is very firm at first - the foam and fabric also feels a bit cheap. Hopefully once its broken in, it would be more comfortable. But the design is very nice and looks just like the picture. brought my living room back to life! Everything looks a lot tidier and more modern with just this one furnishing, completely changed the whole style of my living room and I love it! Splayed legs really take this design to the next level, very attractive and plush cushions make it extremely comfortable, i love it! The tapered, splayed legs on this sofa are what caught my eye. It has that modern scandinavian style which pairs nicely with my other living room furniture. Happy with my decision. Great price point for a great sofa. Very happy with my order. Arrived in perfect condition. Will be back for sure. ProsComfortable. Shipped fast. Delivered great. The cushions are removable, but they are not reversible. Please, what kind of material is the Lena Sofa made of. And I believe it only comes in the gray shown, correct? The Lena Sofa is upholstered in a 100% Polyester material, and is only available in the Dark Grey finish, as shown. What foam does this sofa use? Latex? Poly? High resilient??? The Lena Sofa has a loose back. The support consists of zig-zag springs, elastic webbing and firm foam. The foam is made of polyurethane. The Lena Sofa does not contain any chemicals, VOC's or fire retardants. How high is the seat height- from where you sit down? The Seat Height of the Lena Sofa is about 18 inches. Hi, does this sofa have vocs, fire retardants, or other major chemicals? The Lena Sofa does not contain any chemicals, VOC's or fire retardants. The weight of the Lena Sofa is approximately 160 lbs. What is the height to the top of the armrest? The Arm Height of the Lena Sofa is 24 inches. How firm are the cushions on this sofa? How firm does it sit, does it sink in or do you sit upright, comfortable but firm? The cushions for the Lena Sofa are firm. What Is the support made of - hand tied coil springs, arc springs (zig-zag springs), machine wired coil springs, or etc.? What is the foam density? Is this a tight back or loose back sofa? The sofa has a loose back. The support consists of zig-zag springs, elastic webbing and firm foam. What are the dimension of this sofa ? This sofa is 84" w x 36" d x 31" h.